Photo of the burned out car by Marysol Reynaldo Sosmena. 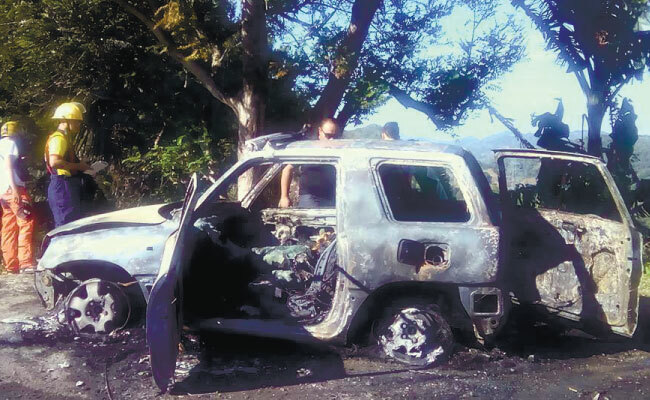 The remains of Timothy Wilson from Toledo have been found in a burnt-out car in Barangay Busay, Cebu City. His severely burned body was identified by his wife Joy. Police say the Toyota was clearly set on fire deliberately. The prime suspect is an Australian who was friends with Wilson and owed him a substantial amount of money. Police, who have not released his name are still hunting the suspect.